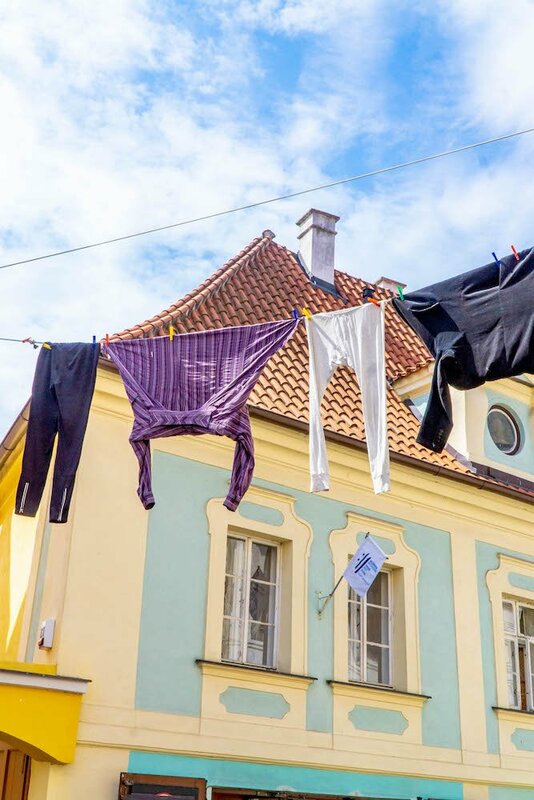 Visiting Cesky Krumlov – what to do, where to stay, what to eat, and how to visit the fairytale town of Cesky Krumlov in Czechia’s South Bohemia. There are so many towns I’ve visited that I want to spend a lot more time in – the kinds of places you visit that are totally and completely magical in a way you can’t get out of your mind – and Cesky Krumlov, in south western Czechia, is at the very top of my list. It’s a town perfect for people who love history, art, architecture, hiking, kayaking/river rafting, castle spotting, trying new foods – or just people watching. There is definitely something for everyone in Cesky Krumlov! Cesky Krumlov has become incredibly popular with tourists – making travel to the city easy – but retains all of its medieval charm. If you’re visiting Prague, a stop to Cesky Krumlov should absolutely be on your itinerary! 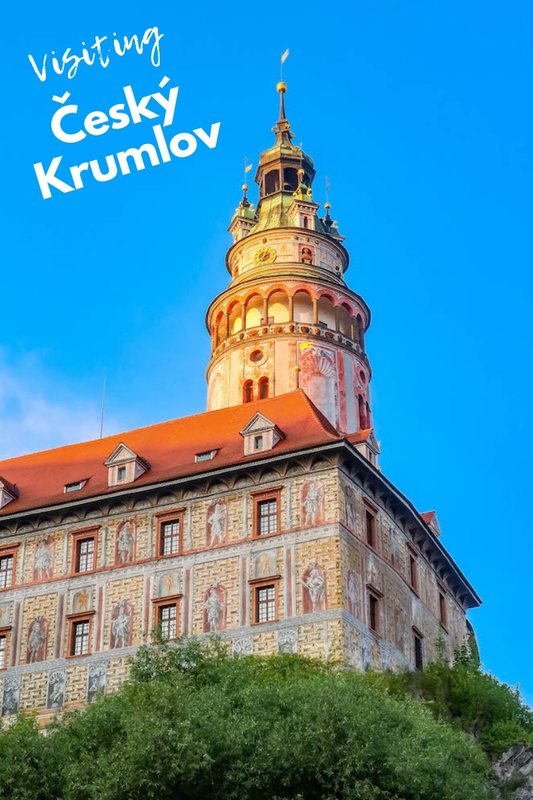 I’m sharing all about Cesky Krumlov, including where to stay and what to do. 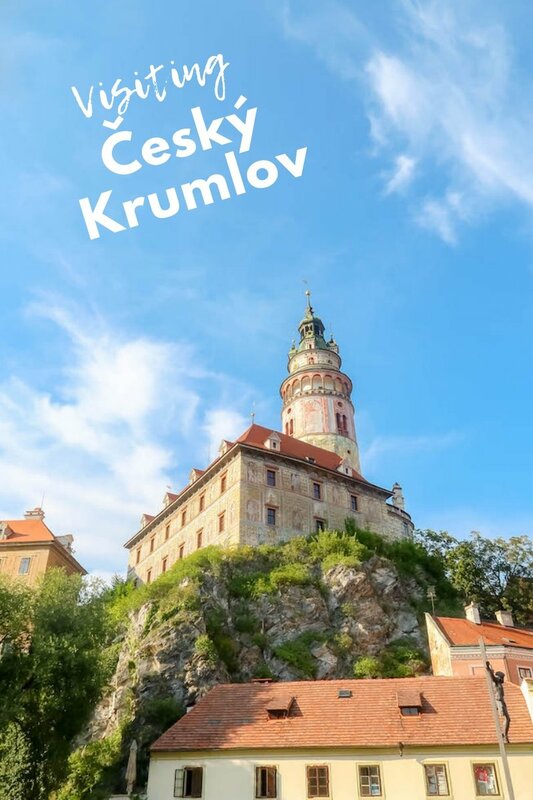 The bottom of the post has a sample itinerary you can use for your own fabulous trip to Cesky Krumlov! Cesky Krumlov is often called “The Pearl of Bohemia” – and for good reason. If I could name one town I would go back to in an instant, Cesky would be at the very top of my list. 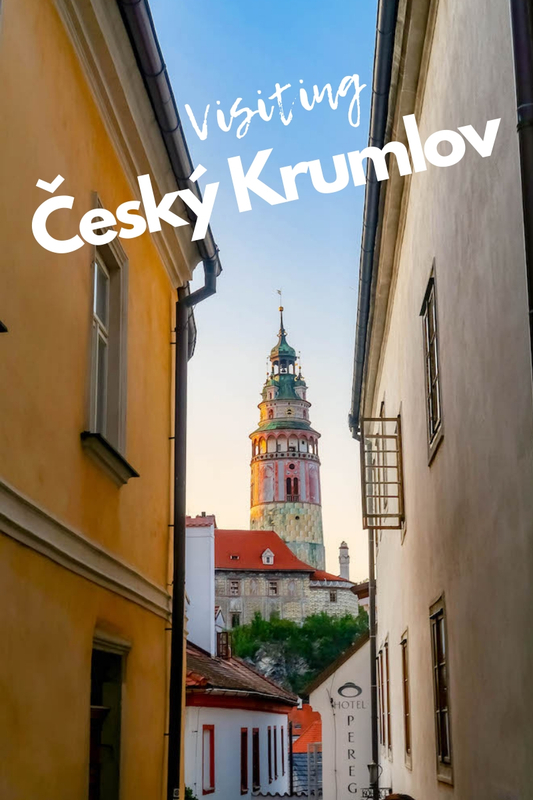 When my family went on a road trip from Western Germany through Czechia and Poland this summer, I had my sights set on one town in particular – Cesky Krumlov. 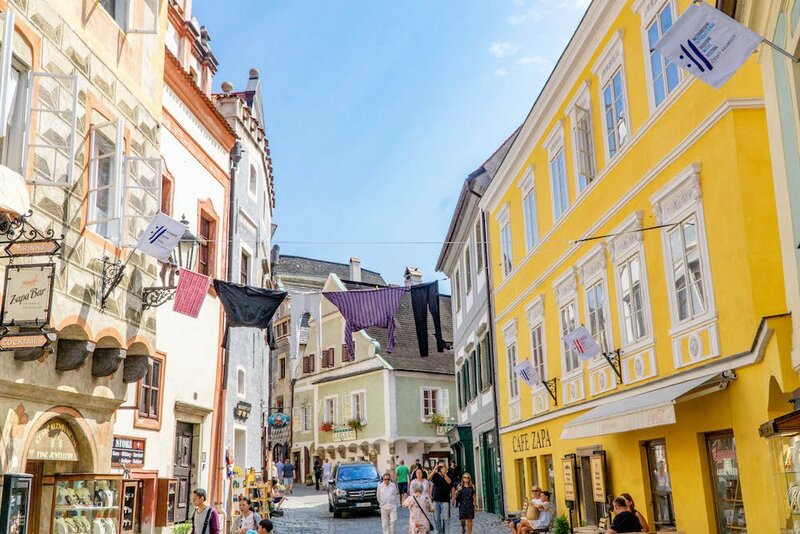 From the second we pulled into the outskirts of town, we knew we were somewhere special – even though my kids were cranky in the car, they started walked through the quaint cobblestone streets and instantly perked up. We spent one of our best nights all summer just walking through Cesky, playing in the river, watching street performers, taking photos, touring the castle, and popping into all the shops. It was amazingly magical – and I can’t wait to someday head back! This adorable town in the South Bohemian region of Czechia (formerly the Czech Republic – the name was officially changed recently) has been a designated UNESCO World Heritage Site since 1992, and is becoming a wildly popular destination for it’s picturesque fairy-tale views tucked into the Vltava river’s snaking river bends. It is small – only about a 20 minute stroll from one side of town to the other – safe, and totally and completely charming. Centered around the Cesky Krumlov Castle, built starting in 1240 by the Vitkovci family (descendents of Witiko of Prcice). Local legend says that the name is derived from the Middle High German krumbe ouwe which translates to “crooked meadow,” after the bend in the Vltava River. 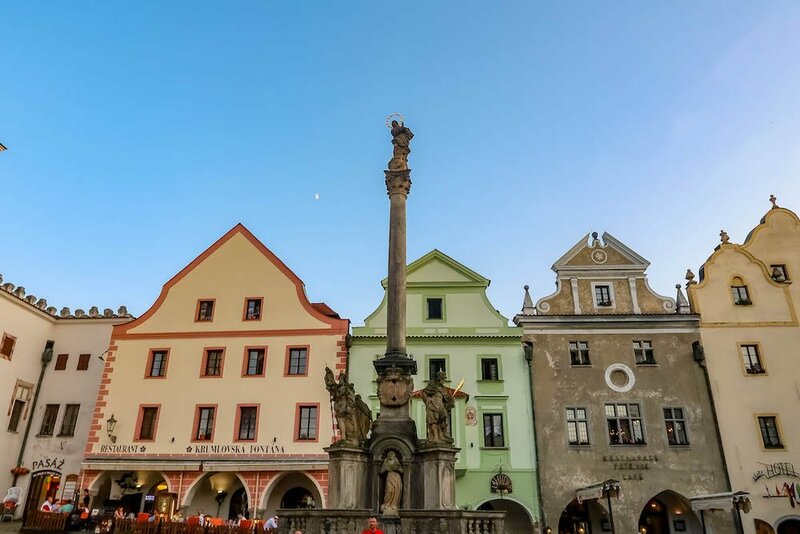 Many places in Europe are known for their turbulent history – from feudal conquests to World Wars – but Cesky Krumlov is so well preserved in part because the area was tucked away from most of the troubles the rest of Europe saw. The Cesky Krumlov Castle and the town adjacent to it were built starting in 1240 by the Vitkovci family (descendents of Witiko of Prcice). The fortress along an important trade route in the Kingdom of Bohemia was first mentioned in a 1253 deed, and in a 1255 poem by Ulrich von Liechtenstein. As Germany adopted formal policies to expand east, Czechs quickly became the minority in Bohemia. In 1910, the town had over 8,600 inhabitants – with less than 1,300 Czechs. After World War I, the city was part of the Bohemian Forest Region, initially declared as part of German-Austria. The Czechoslovak Army occupied the region by the end of 1918, and it became part of Czechoslovakia – which was then later annexed by Nazi Germany in 1938 under the Munich Agreement. In 1947, the castle was confiscated and taken back by the Czechoslovak government. Following World War II, the town’s German-speaking population was cleared out and the region returned to Czechoslovakia. Since the “Velvet Revolution” of 1989 overthrowing the communist Czechoslovakian government, the town has been greatly restored from the neglect of the soviet era. In 1996, Pinocchio was partially filmed in Cesky Krumlov, bringing the small town’s charm to American audiences – and the town has quickly become a popular draw to tourists around the globe, while still maintaining it’s authentic charm. Cesky Krumlov is the kind of town you can see entirely in one day – but could easily spend a week in without getting bored. It is small and easy to walk all over – with jaw dropping views, medieval architecture, warm faces, and delicious food around every corner. If you’re limited on time, Cesky’s biggest attractions are the easiest to find: the castle, the old town, and the river. 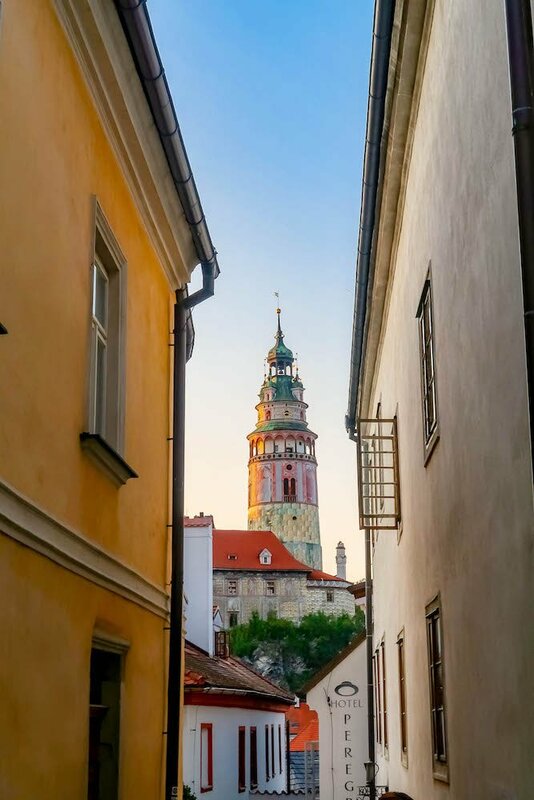 It’s hard to not think immediately of the castle when thinking of things to see in Cesky Krumlov – as it is such a huge part of the town – it is such a gorgeous and well preserved castle, and is definitely worth the visit! Cesky Krumlov Castle has Gothic, Rennaisance, and Boroque elements, and is very large in comparison to the small size of the adjacent town, second in size only to the Hradcany castle complex in Prague. The grounds include an 11-hectare rococo garden (which is a must-see), an extensive bridge over a deep gap in the rock that the castle is built upon, a moat featuring bears, and the large castle itself. 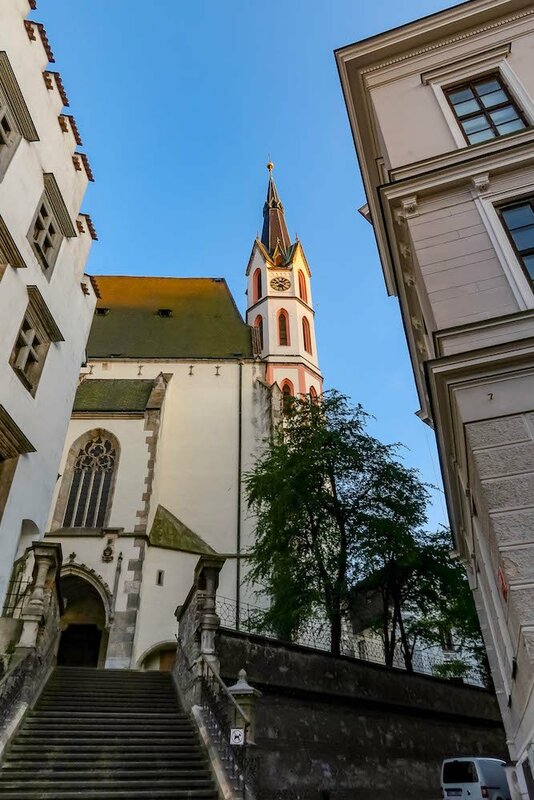 The castle complex includes the Church of St. Vitus (gothic church dating to the 15th century), and the Castle Theater (Baroque theater) built in 1680 by Prince Johann Christian I von Eggenberg and renovated in 1765. The Theater is one of the few court theaters of its time that retains its original stage machinery, scenery and props. The Theater is now used three times a year, when a Baroque opera is performed in simulated candlelight. 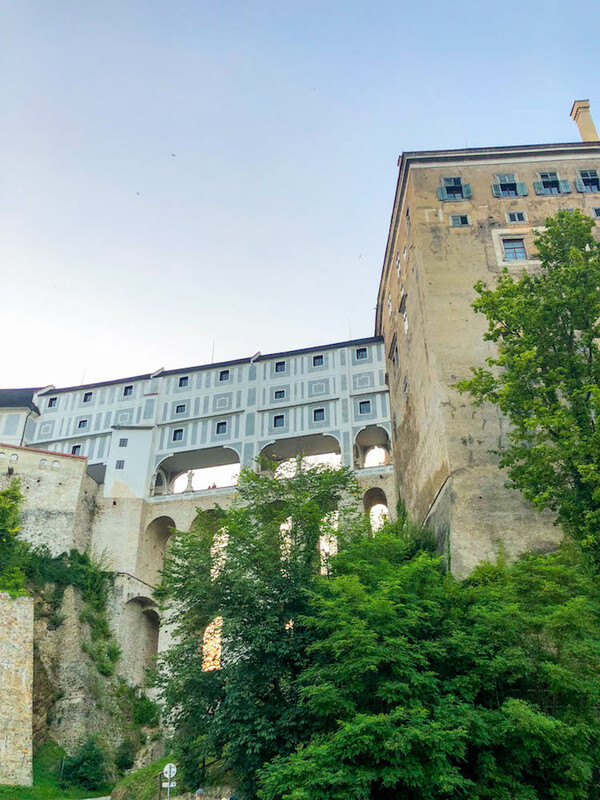 We actually stayed in town during a performance at the castle and could hear the opera when we opened our hotel windows – it was absolutely magical! Visitors can take a guided tour underneath the stage and see the wood and rope pulley system that allowed stage settings to be moved around while audiences were distracted by fireworks and smoke. 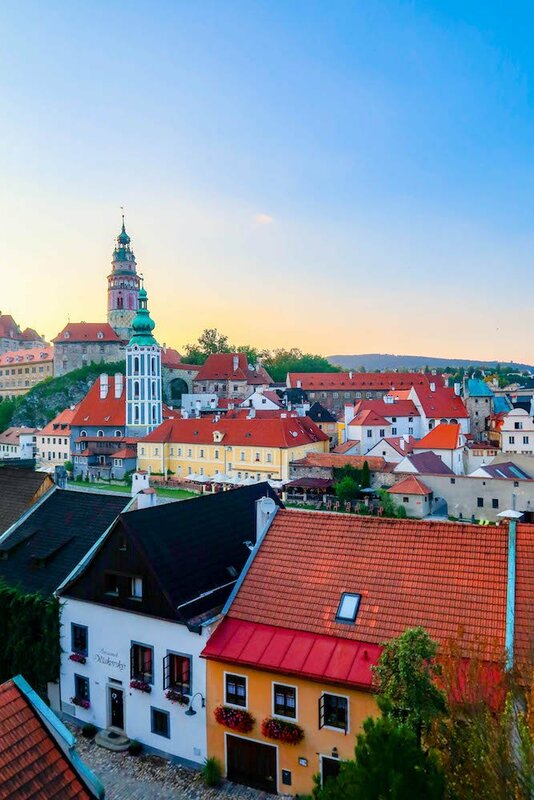 Cesky Krumlov’s old town is packed with adorable art galleries, tourist shops, craft markets, bottle shops, and more – you could easily just walk through the old town and be completely happy with a visit to Cesky Krumlov. Since the town is so small, you can just start walking and pick any street – you’ll eventually connect to the town square, the castle, the river, or the cathedral…. I love towns that are set up to just stroll around through, and Cesky Krumlov is the perfect town to just walk around and explore all of the delightful buildings and shops around every corner. The Vltava river snakes through Cesky Krumlov making it a main part of the town – with small channels running alongside cobblestone streets. In summer, kayakers, rafters, swimmers, and boaters can be seen going up and down the Vltava and splashing around to keep cool. The entire area is well known for river sports – there are tons of outfitters who will drive you up the river to float into town, or you can rent a kayak or a raft all along the Vltava River through Bohemia – for a couple hours, or longer. The river is adorned with cozy cafes all along the city – a spot at a table by the river is the best place to sip wine, eat food, and people watch! Five-Petaled Rose Festival – held on summer solstice weekend, the downtown area is turned into a medieval town including jousting, fencing, historical dance performances and folk theater, with craftsmen, artists, musicians, and locals in medieval costume. International Music Festival Cesky Krumlov – begins in July and ends in August. If you’re staying in Cesky Krumlov for longer than a day trip, you’re in luck. The cozy town is crawling with charming small hotels, hostels, and B&Bs. 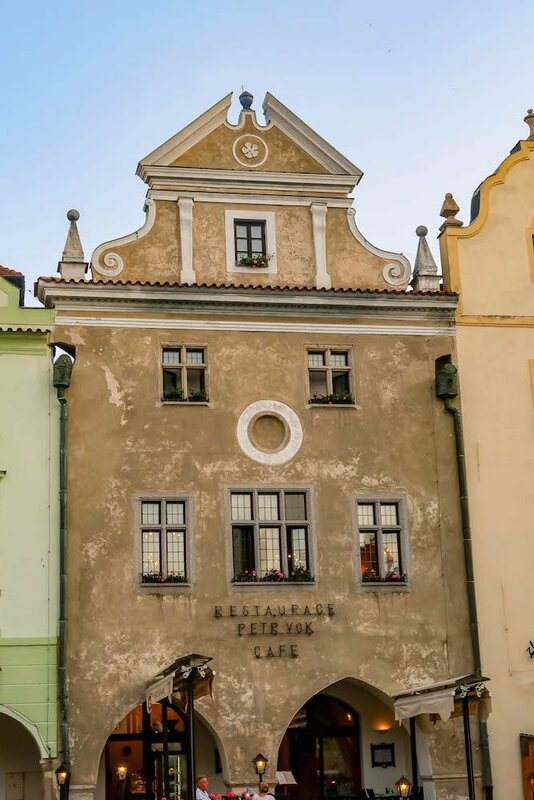 There are a number of small, boutique hotels in Cesky Krumlov that are great to stay in – with great amenities for all budgets – from hostels to boutique suites with ensuite bathrooms and plush out-fittings. While there are quite a few adorable boutique hotels in Cesky Krumlov (and I know I’d have loved all the ones I saw), we stayed at Krumlovská Pohádka and absolutely loved it. 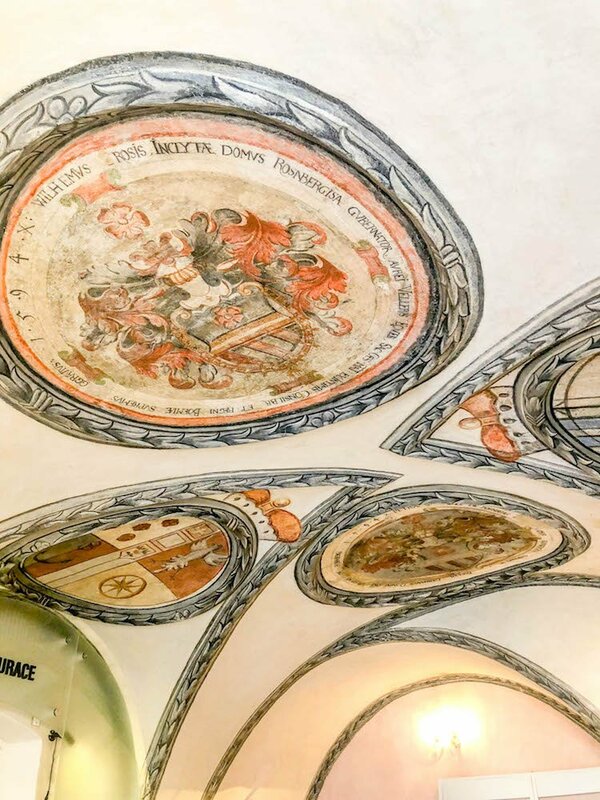 The building is impeccably designed – and honors the history of the building, including frescoes, arched walkways, and period pieces like ceramic room heaters that feel opulent and rich! The rooms at Krumlovská Pohádka are exquisitely decorated, including a large ornate ceramic heater and extremely comfortable beds, as well as a large TV with lots of international channels. We also were treated to a delicious breakfast buffet (and truly great coffee, sometimes a rarity in Eastern Europe) in the morning with our booking. Be sure to have the passports of anyone staying in your room handy, as we were asked to show all passports, including our Children’s, for the hotels records. The hotel had plenty of staff fluent in English, German, and Czech so communicating was easy. Tip: if staying in the summer months, be aware there is no air conditioning – and the entire town can get very hot. We visited on the hottest day of the year and were a bit uncomfortable at night and had to sleep with the windows open, even though that meant taking in smoke and loud shouting from late night bar-goers. Tip: if you’re staying with kids, book Room 303, which offers a very comfortable pull-out couch. When looking for a hotel in Cesky Krumlov, you might get thrown off by listings for “pensions”. Unlike in America, a pension in many Eastern European countries simply means it is a smaller, often family-owned hotel. Many pensions in Czechia have their own spas – especially near the healing spring waters in Karlovy Vary – but many pensions in Cesky Krumlov and nearby Lipno also have extremely affordable, clean, and relaxing spas in them. 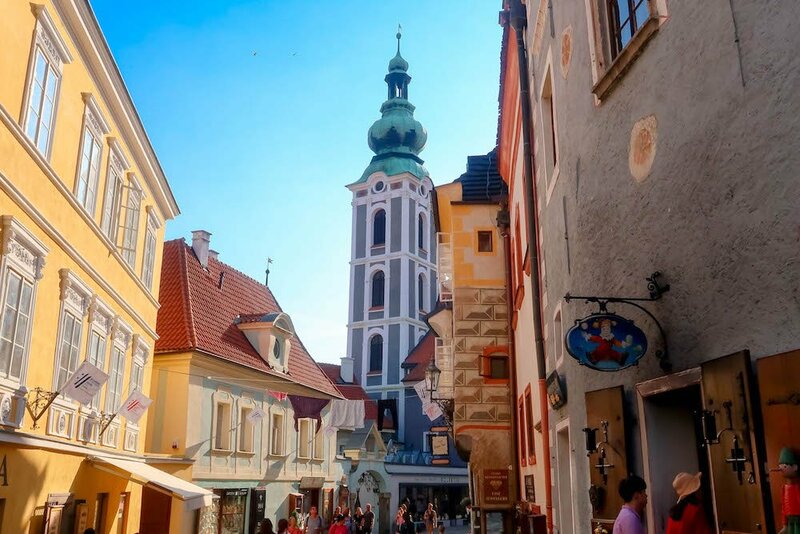 Cesky Krumlov is a fantastic town to shop in if you’re vacationing in Europe – those that appreciate prices in Prague (thanks to a very favorable conversion rate for Europeans and Americans) will LOVE shopping in Cesky Krumlov, as the prices are even lower. 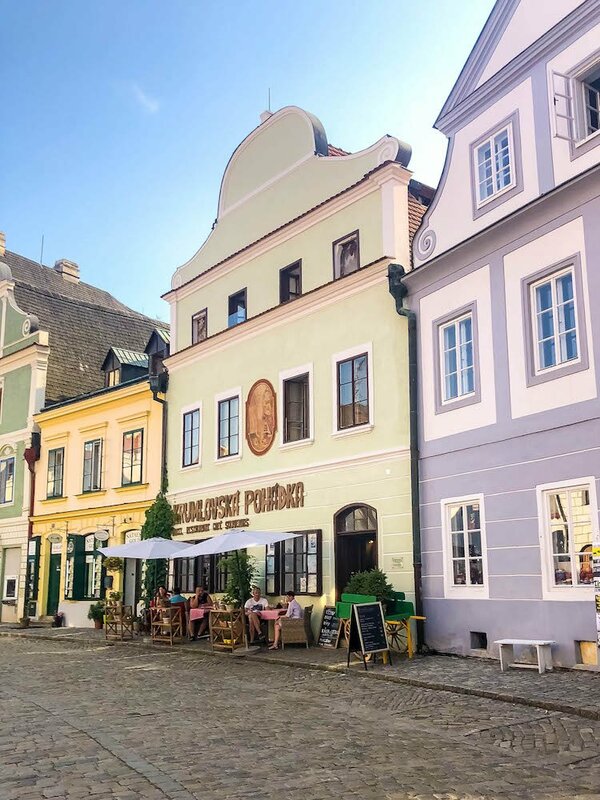 Look for handmade puppets (the whole town is known, as is most of Czechia, as a top producer of gorgeous wooden puppets), wood toys, fabrics, artisan chocolate, Czech wine, Czech liquor, art, ceramic pottery, and antiques. Hot tip: most places in Cesky Krumlov will take credit cards, and while the Czech Koruna is the official currency, many vendors will accept euros or even dollars. 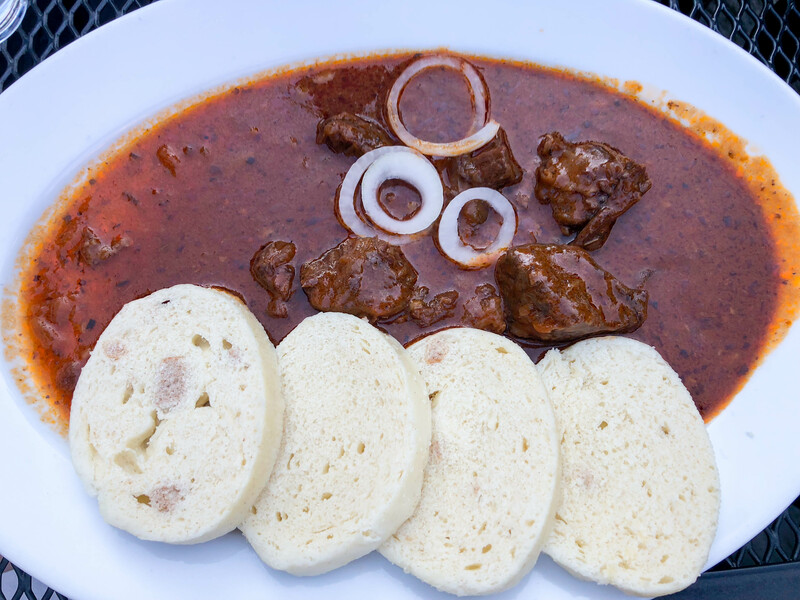 Czech food is simple, rustic, and delicious – with both German and Hungarian influences that are hearty, comforting, and bursting with flavor. For such an esteemed dish, they are quite simply made with flour, milk, eggs, and stale bread cubes which are formed into a loaf or roll, boiled, sliced and served. Chimney cakes, or Trdlo, are popular all over Czechia – and are great for breakfast or dessert. 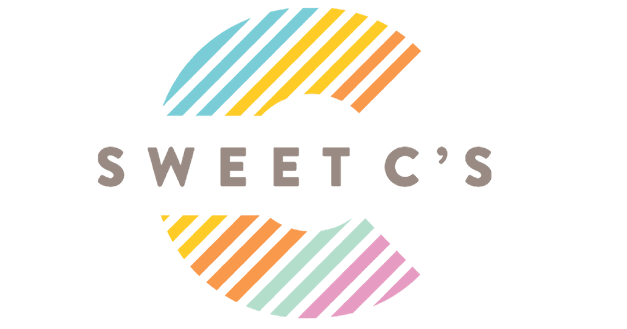 There are small stands all over Cesky Krumlov selling over the top sweet Trdlo combinations – or simple fruit-filled creations that are great to recover from the night before. Train service is one of the easiest ways to get to Cesky Krumlov if you can make the timetables work into your trip – train service in Czechia is clean, safe, mostly comfortable, and reliable. The train leaves Prague’s central Hlavni station at 08:02 arriving Cesky Krumlov at 10:50. To get to Cesky Krumlov, the bus is one of the easiest and cheapest ways to arrive. There are numerous bus lines that provide free movies, wifi, and some premium features. From Prague, the bus route is just under 3 hours. From Munich, the bus route is about 5 hours and 20 minutes if you can book a direct ticket. By RegioJet Bus – tickets around 10 euros. By Flixbus – tickets around 12 euros. Cesky Krumlov is an easy town to get to from across Czechia, southern Poland, and even Western Germany. The roads into Cesky Krumlov are well maintained dived highways (except some routes out of Western Germany – we did end up on some single track roads through a National Park which were gorgeous but a little nerve-rattling looking for other cars on the tiny lane through the woods) making Cesky Krumlov a great town to stop in on a longer journey. We drove from Heidelberg to Cesky Krumlov in about six hours (through the most jaw-droppingly beautiful scenes in Germany and Czechia) – and then from Cesky to Krakow, Poland the next day in about the same amount of time. Cesky Krumlov is an almost exclusively pedestrian city (deliveries, some drop-offs, and very limited cars are let through with proper permits) – making it extra charming, and a little bit tricky to plan. The lots in Cesky Krumlov are monitored – both by camera and staff presence – and relatively safe. If you’re staying in the old town area, the easiest place to park is P1 – Jelení Garden – the castle lot. If you park in P1 at the castle, and you’re staying in the middle of the old town (on the peninsula), it is a very short walk underneath the arched castle bridge. I didn’t realize this was a shortcut and instead made us trek about a mile around the castle and up the winding cobblestone streets (with luggage in tow) – which was not the most fun surprise. While the walk around town is fabulously gorgeous, it wasn’t fun in very hot summer sun with rolling suitcases and tired kids – so be sure to look carefully to see which route is the faster walk to your hotel if you’re arriving by car. 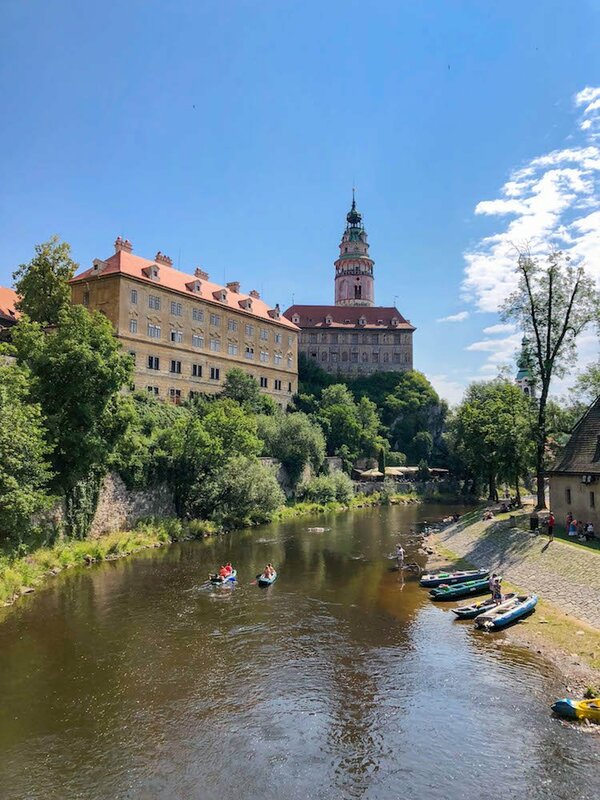 Czech – though German is very prevalent, and while most people in Czechia will understand a little English, Cesky Krumlov is such a tourist draw that most people speak perfect English, especially those under 40. Czech koruna, credit cards widely accepted some vendors will take Euros and Dollars. Photos are NOT allowed in most parts of the castle. You must pay for a tour if going to the castle. Zlata Koruna – 10 km (6 mi) away, this is one of Bohemia’s oldest monasteries. Lipno Treetop Walkway – 40km away, a series of walkways and a long slide, built into the treetops and often featuring light shows and special events.